On 11 September 1988, an estimated 300,000 people gathered at the Tallinn Song Festival Grounds to listen speeches by the Estonian independence movement activists and sing songs. 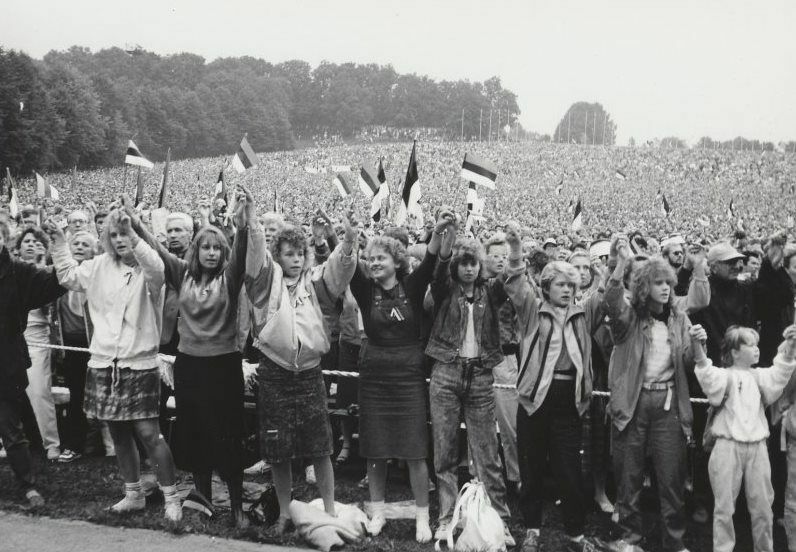 On 11 September 1988, the Song Festival Grounds hosted arguably the largest mass gathering the Estonian capital had ever seen, when an estimated 300,000 people from across the country came together in an unprecedented national solidarity – the unity unseen since. This concert was another milestone – and one of the most important ones – in a peaceful independence movement that had kicked off a year before by a vocal opposition to the Soviet government’s plan to excavate phosphorite in Estonia’s Lääne-Viru county. Since the reformist Soviet leader, Mikhail Gorbachev, had allowed more press freedom, some Estonian journalists were brave enough to tackle and inform the public about the phosphorite excavation’s potentially catastrophic consequences to the environment. The Estonian national television’s environmental programme, “Panda”, was the first to reveal the truth in February 1987 when its host, Juhan Aare, interviewed a Soviet official in Moscow. The official announced that the Soviet authorities were planning to start mining phosphorite in Estonia by 1997. The revelation started a public environmental campaign against the excavation and the Soviet authorities eventually withdrew their mining plans. During the campaign, in May 1987, some of the biggest names in the Estonian pop and rock music scene at the time gathered to record a song and film a video for “Ei ole üksi ükski maa” (“No Country is Alone”). This subtle protest song was written by Alo Mattiisen and Jüri Leesment and is considered a prelude to the five most important Singing Revolution songs that Mattiisen would write in the following year. Encouraged by a more liberal mood in the society, in August 1987, the Estonian Group on Publication of the Molotov-Ribbentrop Pact was founded. The group organised a mass meeting in Hirvepark in Tallinn the same month, where people demanded that the secret protocol of the 1939 pact be made public. The meeting was not forcefully disbanded, as would have happened before, which showed that civil rights had expanded, and the Soviet regime had softened – the authorities even granted permission to hold the demonstration. Simultaneously with the increasing political freedom in society, Estonians started demanding economic reforms and the right to make their own decisions. In autumn 1987, the idea of self-managing Estonia (Estonian acronym IME), proposed by Siim Kallas, Edgar Savisaar, Mikk Titma and Tiit Made, was enthusiastically discussed in the Estonian society. The plan was to make Estonia economically independent from the Soviet Union – adopt a market economy and establish Estonia’s own currency and tax system. The Estonian society woke up politically en masse in 1988. A joint meeting of the creative unions (writers, artists, architects and theatre and film people), which focused on the Estonian national culture and the threat of intensifying Russification, publicly expressed dissatisfaction with the activity of the Soviet Estonian leadership, led, at the time, by the Russian-born and Russian-speaking Karl Vaino. In mid-April, the Estonian Popular Front was founded. The movement, proposed during a live Estonian Television programme by a then mid-ranking Soviet Estonian official, Edgar Savisaar, wanted to make the Soviet Union more democratic and demanded political and economic autonomy for Estonia within the Soviet Union. The Popular Front quickly became a powerful mass organisation that was also one of the main organisers of the large concerts taking place that year – including the one on 11 September 1988. The term, “Singing Revolution”, was coined by the Estonian activist and artist, Heinz Valk, in an article published a week after spontaneous mass night-singing demonstrations took place at the Tallinn Song Festival Grounds on 10-11 June 1988. A month before, in May, the “five patriotic songs” series, composed by Alo Mattiisen and sung by Ivo Linna, premiered at the Tartu Pop Festival, in the country’s second largest town. From then on, the five songs formed the emotional backbone of the independence movement and were performed in all the important open-air concerts that summer – including the very first Rock Summer festival, first of its kind in the Soviet Union. The sentiment surrounding the Singing Revolution reached its peak at the Eestimaa Laul (Estonia’s Song) concert on 11 September, at the Tallinn Song Festival Grounds. It was estimated that 300,000 people attended the free event – although there remain some doubts whether the number is accurate. To put this into perspective, the country’s total population was about 1.5 million at the time. 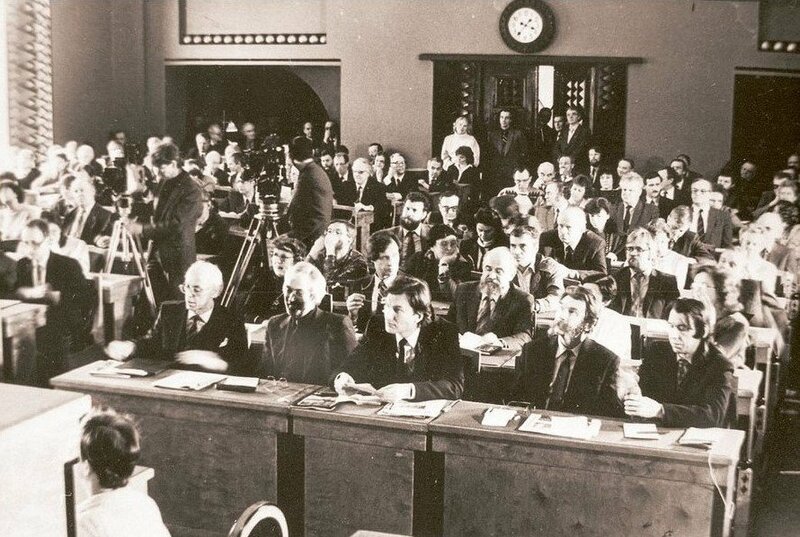 The agitating speeches by various independence movement figures – such as Heinz Valk, Rein Järlik, Siim Kallas, Edgar Savisaar, Rein Veidemann, Mikk Mikiver and Trivimi Velliste – incited excitement and emotions were running high. It was Velliste, at the time a chairman of the Estonian Heritage Society, who in his speech first expressed the ambition to regain Estonian independence from the Soviet Union. Valk, for his part, in his speech first proclaimed what would become the most famous slogan of the Estonian independence movement: “One day, no matter what, we will win!” (“Ükskord me võidame niikuinii!“ in Estonian), a reference to the struggle of regaining independence. Cover: Estonians at the Tallinn Song Festival Grounds on 11 September 1988.